Very nice product, not to bad to put together! It hid the litter box, and was easy to open the lid to clean out when needed. You also have room to put the scoop and baking soda or someother smell good in the box too for storage. 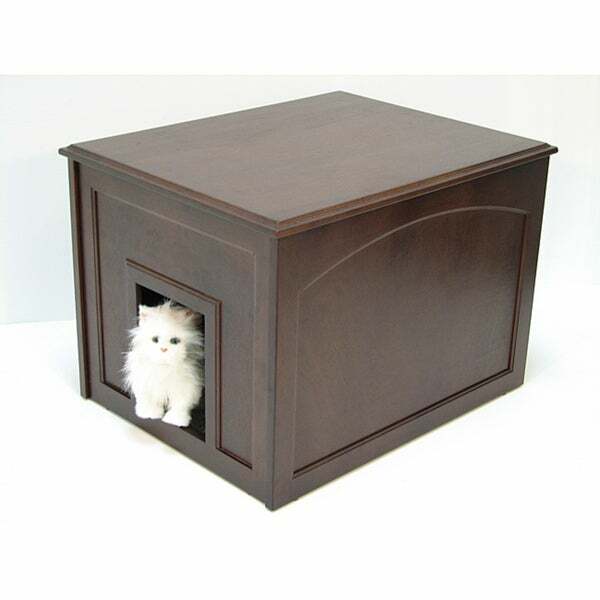 Hide your cat's elimination space away from view and reduce unwanted odors with this Crown Products kitty litter cabinet end table made of eco-friendly rubberwood. The hinged top simplifies scooping and lets you easily add litter to the tray below, while the closed compartment gives your feline family member some privacy during litter box use. This was very simple to assemble. It is very attractive and sturdy as well. This is much nicer to look at than the litter box itself. It also helps contain some of the litter that inevitably gets strewn outside of the litter box. I have not had this very long but it also seems to reduce the smell from the litter box as well. I have multiple cats/litter boxes but I purchased only one to see if I liked it before ordering more. I will definitely order 2 more for my other litter boxes. Product works exceptionally well as a litter box hide away. The litter box is placed perpendicular to the entrance which leaves room for cat to enter and also for storage of litter box products. It looks nice behind mynchair in the living room. Hides odor well and provides a resting spot for my cat. I would recommend it to a friend. This is a very good way to hide your litter box and it does a good job of masking odor if your litter box does. My only complaints are that it is pretty small in person and it limits the size of litter box you can put in it. We put a jumbo litter box in there because the smaller ones weren't working with three cats and we had to remove some hardware for it to fit and it still sits slightly open because of the size of the litter box. I would think this would be ideal for a small apartment with one or two cats at the most. The color is lovely, the quality is great, the assembly was easy. All in all good product, just small. 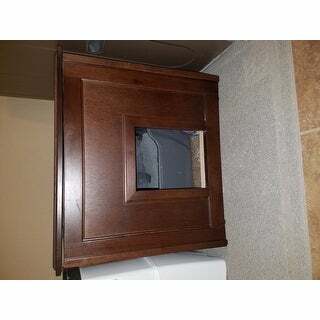 This cat litter cabinet is a perfect way to hide the embarressing typical litter box. No longer will you see the litter box as an eyesore and in turn it gives your cat an increased sense of privacy. It was very easy to put together and the instructions were clear. The one watchout is to make sure you have a smaller littler box that will fit inside. I found that turning the little box perpendicular to the opening was best. It was a lot better quality than I thought it would be! The wood is actually really solid. It was easy to assemble and hides the litter box really well. I had to take the top off my covered litter box and turn it sideways for the cats to be able to fit but it worked. Now I have one of those Breeze litter boxes and it fits great. I definitely recommend this and I have nothing but nice things to say about it. Solid and attractive piece of furniture. This is a great addition for my cats. I have the box near their cat tree and they're able to jump on the box and it doesn't shift at all. There's room in the box for a large litter box, the scoop and litter storage. I bought two in different colors, both colors matched the pictures. Good value. This thing is FANTASTIC! Loved the first one so much we bought another for our vacation home. I bought the original unit for my daughter who was living in an apartment and needed to have a litter box in her living room. It controls the smell, both of her cats use it willingly, and the hinged lid on top makes it REALLY easy to scoop the box every day. She has been using the piece for almost 2 years and it has gone through 2 moves. Unit is still in great condition. It does take up more space than some similar pieces, but we like the fact that the interior is big enough that the cats can step into the unit first, and then move into the litter box - they don’t have to step directly into the litter box when they enter the unit. I have 2 cats and they seem quite happy with it. The top with hinge makes it easy to clean. Much better looking than a regular covered litterbox. This is an excellent item. The price solidified my decision to purchase it. It took a bit longer to assemble than advertised without power tools, but the workmanship and pre-drilled holes, made assembly much easier. I would recommend this to anyone looking for a quality piece of furniture at a great price. I have cleaned this box completely multiple times (every surface inside and out) and the smell of urine remains. It's as if the materials have absorbed the odors. I have another litter box cabinet that's similar in size, but made from a different company. I've had this one for years with no issues. I'm thinking about throwing this one away and purchasing another one like the other litter box cabinet I have. Don't waste your money on this item. I call this my "stealth" litter box. We love how it disguises the catbox and allows us to have one in the living room. This looks very nice and is large enough to house a large litterbox OR it would also be a great hideaway for the cats as it comes with a carpet square that can fit on the bottom. It was a little challenging to put together, but the fact you can open the lid to access the litter box is very nice! Solution to cats that spread litter everywhere. Works so much better then a regular litter box, and on top of that, it isn't noticeably a litter box it fits right in to almost any decor. My husband said it could go in the living room- it looks that nice. Eventually it went in a walkin closet where it was planned to go. Seriously well constructed. Looks like a piece of furniture. Definitely worth the money. Large enough for kitty litter box and enough room for the cat to wipe paws before coming out. Although the cabinet was nice, the entry way of the cabinet has major fault where the cat will not be able to enter if there was a litter pan. The cats have to practically flatten out to get into the litter box. This is made for kittens. The box just fits in this, with maybe 3" between it and the opening. The bottom piece is too flimsy for a box full of clay! I have to have a high sided pan since my cat sits too close to the edge. Wish I could return it. Expensive mistake. "How many inches from the base is the entry cut-out? I have a handicapped cat that needs a low entry." "What is "Eco rubber wood". Is it waterproof? Is it veneer over particle board or plywood? Please advise. Thanks!" Rubberwood is a light-colored medium-density tropical hardwood obtained from the Pará rubber tree. Rubberwood is commonly advertised as an "environmentally friendly" wood, as it makes use of plantation trees that have already served a useful function. This item is not waterproof. "What are the interior dimensions ? HxDxL"
Hello LBJ, the interior dimensions are approximately 17.5" inches high x 19.6" inches wide x 24.5" inches long. Please let us know if you have additional questions. Thanks for shopping with us. "Can you tell me what the exterior dimensions are? Thank you." Hello Ladyhusky, this item is approximately 26.7 inches long x 21.2 inches wide x 19 inches high. Thank you for shopping with us. "The image is only showing two sides of the cabinet. Does the back match the design of the front and does the right side match the design of the left with the exception of no access?" Thank you for your inquiry, bellann. Yes, this item features a complete finish. We hope this helps. Thank you for shopping with us. "Why is the espresso color more expense than the mahogany finish?" Hello suzynb, The difference in price is a result of these products coming from different warehouses resulting in the espresso costing more than the mahogany option. I hope this information was helpful. Thank you for shopping with us.